Greetings from beautiful Barbados! I am an American lucky enough to have met and fallen in love with a wonderful man from Barbados. Actually, I fell in love not just with the man but with his beautiful island home. This particular apartment, Apt 1, 'Oceana,' is one owned not by me but by another Barbadophile. It is one of the most popular rental properties in the St Lawrence Beach Condos. A luxurious Barbados holiday rental fronting the beautiful Caribbean Sea at reasonable rates. Overall our stay was wonderful. The condo is in a great location .... many restaurants and bars within walking distance. A couple items I would mention. The windows in the bedroom on the kitchen level leaked when it rained. Maintenance came in and put a towel on the floor. There were also little caterpillar type bugs in that bathroom and in the bedroom downstairs. After a couple days I didn't see them anymore. Also, pick up some maps ... there were none in the condo like it mentioned in the description. At night the bars across the street are pretty loud .... so if you are a light sleeper like I am bring earplugs. The internet password that I received was incorrect - it had been changed but I wasn't notified. We got the correct password shortly after we checked in from Ricardo. Expect to be in the airport for at least 1.5 hours waiting in line - unless you are lucky and the only flight that came in. You may want to purchase the express check in from Viator .... I wish I had. 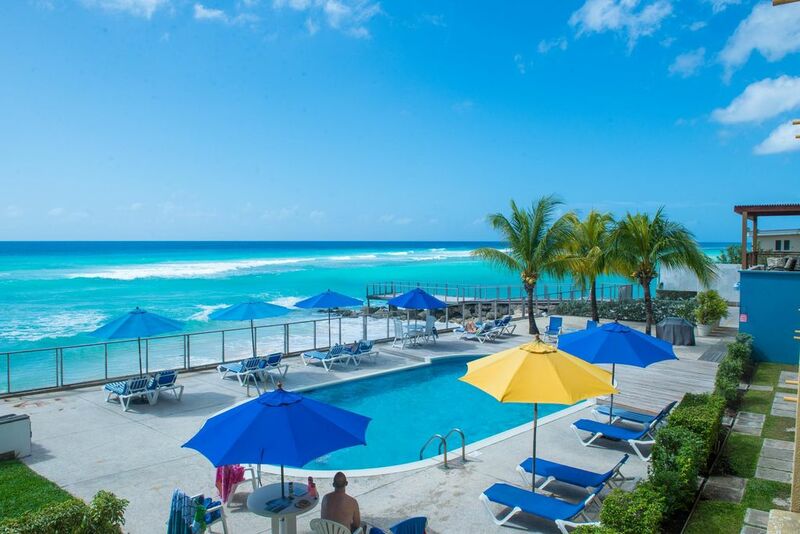 I would recommend the Oceana 1 for your trip to Barbados. OMG! I went to Barbados with 3 of my girlfriend to celebrate my birthday! The condo was everything! The views were amazing and we didn't want to leave. We were right in the middle of all the action and when we needed a taxi, they were always right in front of the building. Jane sent emails with even the smallest details to make sure that we were informed and could maneuver around the island. Ricardo was a gem, as he made us laugh and also checked in to make sure we were safe, knew where to go, and had everything we needed. The round the clock security at the building is also a plus. I would definitely recommend Jane's condo and I'll definitely be back again. A true pleasure it was to have you and your friends visit us here in Barbados. You took full advantage of the gifts of this island during your stay and embraced our culture with open arms. Already I have heard from one of your friends who wishes to return in early December to celebrate her birthday :) Yes, Barbados is addictive! Thank you for choosing the St Lawrence Beach Condos and Apt 1, "Oceana," in particular. I will pass on your kind comments about Ricardo and the security staff. Thank you. First and foremost this was my second time staying at the St. Lawrence Beach Condos; once again the stay was extremely fantastic and pleasant. Let me start by addressing that you are first introduced to the condominium when you contact Jane Shattuck through her email. The level of professionalism and warmth to help assist is quite outstanding. She is sure to work with her clients and is always available with such proficiency and quickness that it made booking the stay effortless. Her helpfulness,patience and kindness let me know I was going in the right direction in booking my stay last year and this year. This year I rented Apartment 1 Oceana and Apartment 3 Paradise Island. Both accommodations were exquisite. They are a 2 floor unit, the bottom hosting access to the pool with a king bedroom. I personally love the feel of getting away from my apartment mates and going to my downstairs cove. The apartments are modernly furnished and equipped with all your needs (dishwasher, wash/dryer, tea maker, etc). Towels and beddings as well as pool towels are fresh and servicing of the rooms come every 3rd day. The pool is beautiful and kept clean at all times. We have spent countless hours just wading and sleeping (lol some friends of mine in the pool others out). When we reached both years we were greeted by Bldg support Ricardo who is an absolute GEM!!! I don't know what I would've done without him especially this year. He is sweet, welcoming and such a help. He makes the stay incredible and secure. The establishment is safe as well as only yourself and your guests have the access code. After settling in you are left to your own accord unless you need assistance. The location of the property is also a plus. It is right at the beginning of "The Gap" and close to pretty much what the BIM Cropover Carnival Experience is required. Food, market, clubs, lounges, beach, taxi service all up for grabs at this prominent location. In a honesty I can't see myself coming to Barbados and not contacting Jane first for my accommodations. Her service, the staff and the beauty of the property each alone sell the stay. I truly am glad I found this piece of heaven. Welcome back to another relaxing and enjoyable vacation in Barbados! I thank you warmly for your very lovely, very generous review. You are a love to work with and we always appreciate your uplifting presence here in Barbados. I will pass on to Ricardo your "fan mail" ... I know that when you reserved your condominium for your stay in 2016 you mentioned you didn't want to consider any building other than the St Lawrence Beach Condos because you wanted Ricardo nearby! I completely understand this; Ricardo combines a thorough knowledge of the island, an ability to repair absolutely anything, and a sparkling personality. There is not one negative I can say, from the minute I booked the apartment it was a premium service till the end of our stay. I have rented a lot of accommodation especially in Barbados but I have never stayed in a more spectacular property, it’s outstanding. Jane is absolutely wonderful; nothing is too much for her she is always at the end of an email to ensure your stay is impeccable. The amenities on offer with this property is most certainly a home from home (if not better?). You know some times you see pictures of a property and when you arrive you know they were taken 10 years ago because it doesn’t live up too them. Well this property’s pictures do not live up to the real life experience, as you enter the apartment you are amazed by the breath taking view and it gets better as you move around the apartment. You are centrally located and a car is not essential, you have everything at your finger tips and if something is out of reach you can bet that one of the staff at the apartments will be more than happy to help get what you need. Absolutely incredible worth every penny!!!! We could not have more good things to say about the facility, the management and the location. Everything was as advertised or better! The private beach was great for our kids. The condo was clean and well appointed. Being close to restaurants was a bonus.